Paul begins his first missionary journey. HE CHURCH IN Antioch grew in numbers until there were many who were called Christians in that city. And God caused the teachers in the church to understand that the time had come when Barnabas and Saul (who from the time of this journey was called Paul, by which name we shall hereafter know him) should begin the great work of preaching the gospel to the Gentiles, not in cities where other disciples lived, but in far-away countries where few people understood about the true God. And so it was that these two men, taking with them John Mark, the young disciple from Jerusalem, started on their first missionary journey. The Island of Cyprus, lying in the Great Sea, was the first stopping-place of these missionaries. There they visited two cities, called Salamis and Paphos, and preached Christ. While they were preaching in the latter city the Roman governor who lived there sent for them. This governor, Sergius Paulus by name, desired to hear the word of God and listened carefully while the missionaries talked to him. He was almost ready to believe that Jesus is indeed the Christ, when a wicked man began to talk to him and warn him against the missionaries. Just as the Holy Spirit gave wisdom to Peter, causing him to know when Ananias and Sapphira were trying to deceive him, so now the Holy Spirit caused Paul to know the evil purpose of this wicked man. And with great boldness Paul spoke to him, saying, "Child of the evil one, and enemy of all righteousness, will you never cease trying to oppose the right way of the Lord! Because of your wickedness the hand of God is laid upon you now and you shall be made blind for a certain time, not seeing the light of day." As soon as Paul had spoken the man became blind, so that he could not see which way to go, and he called for some one to lead him by the hand. When the governor, Sergius Paulus, saw what had happened he was astonished, and at once he believed in the power of God and in the name of Jesus, his Son. After the Roman governor believed in Christ, the missionaries went on their way, taking ship for the city of Perga, in the country of Asia Minor. Here John Mark left them and returned to his home in Jerusalem, while Barnabas and Paul journeyed on to another city called Antioch. In this Antioch they found a Jewish synagog, so they came on the Sabbath day to talk with the Jews who worshiped there. The rulers of the synagog, seeing they were strangers, invited them to speak, and Paul began to tell them the gospel story. When he had finished, the Jews left the synagog, and many of them were not pleased with his words. But some Gentiles had been listening, and they came to the missionaries and urged them to continue preaching the good news of salvation from sin. Some Jews also were friendly, and they, with the Gentiles, followed Barnabas and Paul, desiring to hear more about the gospel. On the next Sabbath-day a great company of both Jews and Gentiles met to hear the missionaries tell of Jesus. But the Jewish leaders were filled with thoughts of envy when they saw how eager the Gentiles were to listen to these men and they began to speak unkindly about the missionaries, trying to turn the people away from them. Paul and Barnabas knew of their evil thoughts, and they said, '"It was necessary that the word of God should have been spoken first to you; but we see that you will not believe, for you do not count yourselves fit to receive everlasting life through Jesus. Now we will turn from you and preach to the Gentiles, who are eager to hear our message. For God has commanded us to bear the light of salvation to the Gentiles, even in the farthest places in the world." When the Gentiles heard these words they were glad, and many of them afterwards became believers in Jesus. So a church was raised up in this Antioch, and the missionaries taught the believers more about God's words. But the Jews were not content to let these teachers worship in peace with the Gentile believers. They stirred up a bitter feeling in the hearts of the city rulers toward Barnabas and Paul, and started persecuting them. Then they commanded them to leave the city, calling them trouble-makers and other unkind names. But the missionaries knew they were doing only what was right and pleasing to God, so they went on their way joyfully; for the Holy Spirit comforted them when they were being persecuted. Their next stopping-place was in the city of Iconium. Here a great company of both Jews and Gentiles believed in Jesus, and were saved. For a long time the missionaries stayed here preaching the gospel. But there were enemies in this city also. Some Jews who did not believe talked to their Gentile neighbors and told them untruthful things about the missionaries. 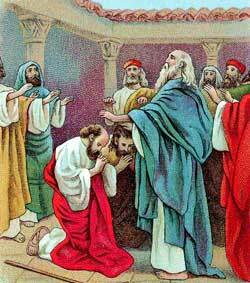 These false stories caused the Gentiles to dislike Barnabas and Paul, and the feeling of dislike grew until finally the enemies planned to stone the missionaries just as Stephen had been stoned at Jerusalem. Barnabas and Paul heard about the wicked purpose of their persecutors, and they fled from the city, going to another town, called Lystra, to preach the gospel there also.